The Pope's Anti-Condom Remarks: Candor Over P.R. 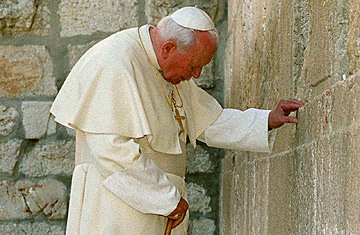 Pope Benedict XVI hopes his planned visit to Jerusalem's Western Wall next month will be taken as a gesture of reconciliation in the long-troubled relationship between Judaism and the Catholic Church. But at least one influential rabbi will take offense  unless the Pontiff removes or conceals the golden cross he wears on a chain around his neck, "out of respect" for the Jews. Quoting King Solomon, the rabbi said the Temple in Jerusalem (the Western Wall is believed to have been part of the Second Temple, destroyed by the Romans in A.D. 70) was a "house of prayer for all people, not just Jews." He added, "We welcome this Pope. But he should show respect for other religions." But Catholics counter that it is the rabbi who should show a bit more respect for the Pontiff and not ask him to hide the cross that symbolizes his faith. Said Wadie Abunassar, media coordinator in Jerusalem for Benedict's trip: "I can't see the Holy Father removing his cross for any reason. He always wears a cross." Given the legacy of bitterness left by centuries of Jewish persecution at the hands of the Catholic Church, the Pope's sartorial choices during his visit to the wall are unlikely to be the only political minefield of the trip. The Jewish community is in an uproar over Benedict's decision in January to lift the excommunication of a Holocaust-denying bishop, a decision for which the Pope later apologized. During his Jerusalem visit, Benedict will pay respects at the Holocaust memorial at Yad Vashem, but he will bypass a room containing a plaque that claims the wartime Pontiff, Pius XII, failed to stand up for the Jews against the Nazis. Vote on Pope Benedict XVI in the TIME 100 poll.